Frozen lumpy ground can make any horse look lame but if the horse has insulin resistance there may be more going on. The first thing to do is rule out foot pain from unforgiving ground conditions, rather than from laminitis. All horses have difficulty negotiating uneven frozen ground and their frogs and soles can become bruised. If this is the issue, all of the horses will be affected to similar extents. They will be obviously more comfortable, if not normal, in their stalls, on mats, or even on a smooth barn aisle. The horses with true winter laminar pain will also be more comfortable off uneven frozen ground, but remain obviously lame. The lameness often appears suddenly and can be quite severe. One laminitis expert has stated nothing is more difficult to treat than winter laminitis. These horses often have a history of prior laminitis problems, or at least a suspicion of insulin resistance/equine metabolic syndrome, but this is not always the case. Some horses have a history of winter laminitis that strikes the same time every year and is resistant to all efforts at treatment until one day in early Spring it suddenly goes away. Winter laminitis can strike with no change in diet or management. The pain is often severe, but the feet are not hot as they are in classical acute laminitis cases. The digital pulses may or may not be elevated. Radiographs tend to remain stable in most cases, without major changes with rotation or sinking. NSAIDs (Non-Steroidal Anti-Inflammatories) like phenylbutazone, which are commonly used any time there is foot pain similar to this, have no positive effect. The body’s normal response to cold is to constrict blood vessels in the periphery to reduce heat losses but in insulin resistant (IR) horses the reaction appears to be exaggerated. The role of the potent vasoconstrictor endothelin-1 in IR is well-documented. The first study investigating the role of endothelin-1 in laminitic horses looked at it in starch-induced laminitis. The most recent study confirmed that endothelin-1 is involved with laminitis due to elevated blood insulin. With normal insulin sensitivity inside a blood vessel the endothelial cells, when exposed to insulin, produce nitric oxide and dilate. If the cells are insulin resistant (and not responsive to insulin) they constrict under the influence of endothelin-1. A normal horse with normal circulation can adapt to the cold and will open and close vessels to perfuse areas before they reach a critical low oxygen level. IR horses have pre-existing damage—even though it may be micro-damage—to the circulation in the feet and there are higher levels of endothelin-1. Cold triggers a reduced blood supply severe enough to cause pain. Protection against the cold is therefore the first step in combating winter related hoof pain. Horses should be protected from high winds, rain and snow. They should be blanketed, wear leg wraps to warm the lower legs and lined boots. Effective lower leg wraps include standard polos and cottons, leg warmers or even fleece lined shipping boots. This helps, but for some horses it’s not enough. If your horse ends up with laminitis even after blanketing and wrapping, supplements to enhance blood flow may help. Herbal products known as “adaptogens” promote healthy stress responses and may be very beneficial. Jiaogulan (Gynostemma pentaphyllum) is a good one to use because it also strongly supports vascular nitric oxide production, which improves blood delivery to the extremities and feet. Jiaogulan can be given twice daily. Amino acids like arginine and citrulline may also be very beneficial in promoting good blood flow to the hoof. Arginine is the precursor to nitric oxide which is a vasodilator. Citrulline is converted to arginine after absorption. Taurine has been found in a recent study to improve insulin sensitivity. L-glutamine is also useful to support antioxidant glutathione and carnitine derivatives to support horses with neuropathic pain and help with insulin sensitivity. It can be confusing when the horse looks like a typical laminitis case but without the heat and high pulses. Inadequate blood supply makes perfect sense and relief is rapid if you warm the feet and legs and support circulation. Eleanor Kellon is the Staff Veterinary Specialist for Uckele Health and Nutrition. 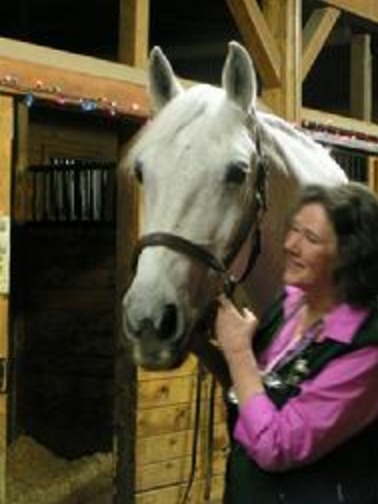 Dr. Kellon also offers private nutritional consultations and online courses through Equine Nutritional Solutions. Find out more at www.drkellon.com.